Powhatan Beaty was an American soldier and actor. 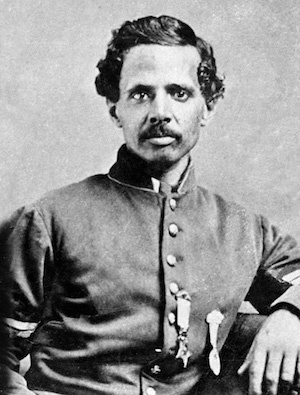 He served in the Union Army’s 5th United States Colored Infantry Regiment throughout the Richmond-Petersburg Campaign during the American Civil War. He received the Medal of Honor, the highest military decoration given by the United States, when he took command of his company at the Battle of Chaffin’s Farm after all the officers were killed or wounded during the battle. After the war, Beaty became an actor appearing in amateur theater productions. Powhatan Beaty was born into slavery on October 8, 1837, in Richmond, Virginia, and would gain his freedom sometime around 1849 when he relocated to Cincinnati, Ohio. While attending school there, he gained an interest in theater and appeared in school concerts. After leaving school, Beaty was an apprenticed to a black cabinetmaker but continued to study acting and received training from several coaches, including James E. Murdock, a retired professional stage actor from Philadelphia. Beaty enlisted in the Union Army in Cincinnati for a three-year term on June 7, 1863, at the age of twenty-five. He joined as a private but was promoted to sergeant shortly after, placed in charge of forty-seven other recruits, and ordered to report to Columbus, Ohio. From there, they were scheduled to be sent to Boston to join the newly created 54th or 55th Massachusetts Infantry Regiments, the only officially recognized black regiments in the United States at the time. When the squad arrived in Columbus on June 15, 1963, they learned that the Massachusetts regiments were full and unable to accept their service. The governor of Ohio, David Tod, requested permission from the Department of War to form an Ohio regiment of African Americans. Permission was granted on June 17, 1863, and Beaty and his squad became the first members of the 127th Ohio Volunteer Infantry, which was later redesigned as the 5th United States Colored Troops. After three months of recruitment and organization in Camp Delaware located outside of Delaware, Ohio, the 5th United States Colored Troops were sent to the front in Virginia. By the time of the Battle of Chaffin’s Farm on September 29–30, 1864, Beaty’s Company G was part of newly formed regiment of black troops assigned to attack the center of the Confederate defense of New Marker Heights. During the retreat, Company G’s color bearer was killed; Beaty returned through about 600 yards of enemy fire to retrieve the flag and bring it back to company lines. Beaty then rallied the Union troops and led them in an attack that drove the Confederates from their positions. Of Company G’s eight officers and eighty-three enlisted men who entered battle, only sixteen enlisted men, including Beaty, survived the attack without wounds. By the end of the battle, over 50 percent of the regiment had been killed, wounded, or captured. Despite the heavy casualties, the Battle of Chaffin’s Farm was a Union victory. For his actions, Beaty was commended on the battlefield by General Benjamin Butler, and seven months later on April 6, 1865, he was awarded the Medal of Honor. After the war, Beaty returned to Cincinnati, married, and raised a family. He resumed his career as a cabinetmaker and pursued amateur acting and public speaking engagements. By the early 1870s, he had become a well-known actor in local theaters and directed music and drama presentations throughout the city. In 1884 Beaty teamed with black actress Henrietta Vinton Davis, and the two began touring across the North, performing in Shakespearian plays such as Richard III and Macbeth. Powhatan Beaty died on December 6, 1916, in Cincinnati, Ohio, at the age of seventy-nine. He was buried at the Union Baptist Cemetery. “Powhatan Beaty,” American Civil War, http://americancivilwar.com/colored/powhatan_beaty.html; Melvin Claxton and Mark Puls, Uncommon Valor: A Story of Race, Patriotism, and Glory in the Final Battles of the Civil War (New York: John Wiley and Sons, 2006); Charles W. Hanna, African American Recipients of the Medal of Honor: A Biographical Dictionary, Civil War through Vietnam War (Jefferson, North Carolina; McFarland & Company, 2002). (Jefferson, North Carolina; McFarland & Company, 2002).